For the rest of us, it's the time to start throwing on turnout sheets, trudging through rainy, gray days to catch our soaked horse and waiting endlessly for everything to dry out and the sun to return. The worst part, we know we’re stuck with the gloom for months on end, until late spring brings us some much needed sunshine. Well, lucky for horse owners, new products have hit the market that finally PREVENT and TREAT rain rot. They’re called COAT DEFENSE, and they’re about to be your go-to grooming aids for keeping your horse’s skin clear and healthy during those rainy, wet months. What is Coat Defense? COAT DEFENSE Daily Preventative Powder is the first dry way to clean pastern areas with an anti-bacterial, anit-fungal layer which will destroy fungal and bacterial colonies before they erupt. In addition it is an excellent dry shampoo when it’s too cold for a hose, a feat that is all too common during these gray months! It is also used under pads, wraps, boots, and blankets to prevent moisture and odor for your indoor winter rides. It’s an all-natural solution with no harsh chemicals. While many other treatments contain chemicals that can actually cause harm to healthy skin, COAT DEFENSE will aid in clearing up affected areas, while nurturing healthy ones. So what does COAT DEFENSE DO that prevents and treats rain rot? It creates a drying environment, which prevents all bacterial and fungal growth. Simple as that, keep the skin dry, starve off the bacteria or fungi and prevent flare-ups. One of my larger clients used the GROOMING POWDER to remove crud, rash, and soreness under the feathers of his Gypsy Vanners - without trimming and shaving! “I first used Coat Defense Daily Grooming powder on a bad case of rain rot on a thoroughbred I adopted from Kentucky. The results were dramatic. It is easy to use, dry, and safe! 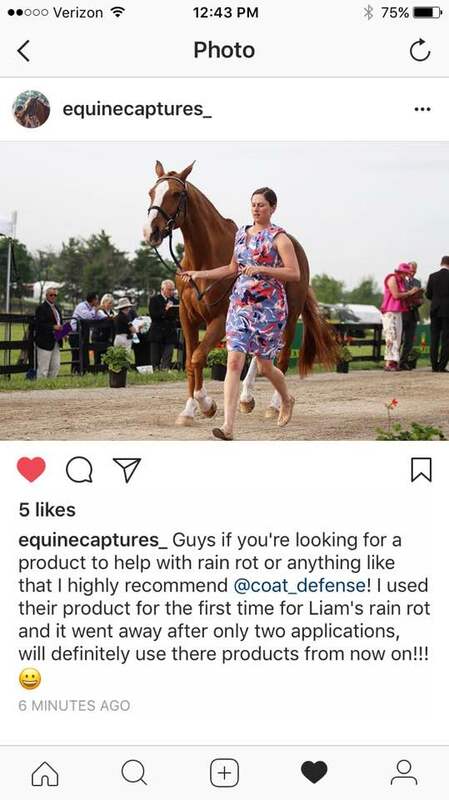 Since then we are using the powder as an anti-chafing and anti-bacterial preventative under boots and other tack.” – Colleen R.
If you’re ready to put a stop to rain rot this winter, head over to https://www.coatdefense.com/shop/ and pick up your powder and paste. Sprinkle the powder on your horse’s rain rot and watch the scabs fall away. Stick some paste on pasterns and cannon bones and watch the gunk dissolve. It’s really that easy.